That is a seriously dull post title isn't it? I wish I could come up with better ones, but sadly that is not where my creativity lies. Anyway, getting to the point, I got my dress cut out yesterday (took almost a whole nap time!) and I thought I'd share a couple of things which make cutting a complicated or multisized pattern easier. 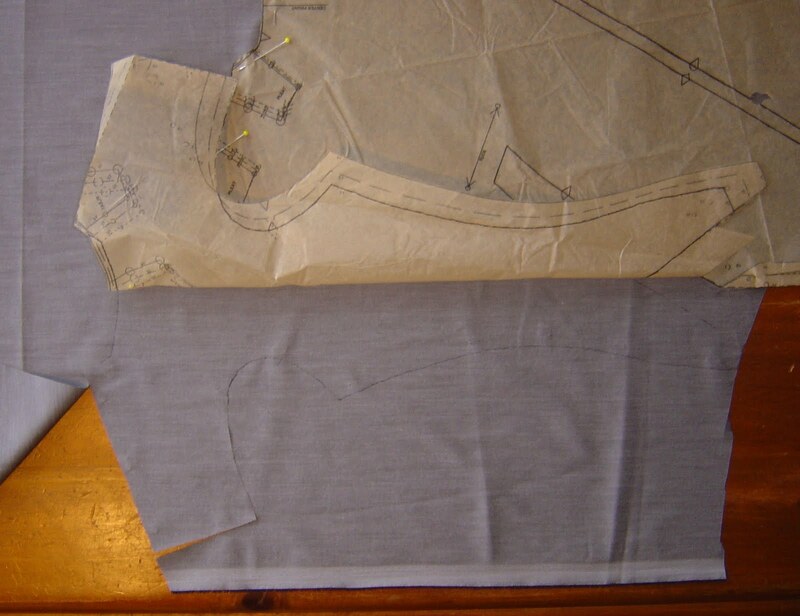 When I cut a tissue pattern I always cut it so that all the sizes are retained because you never know when you might need another size or to grade (which is a whole lot easier if you have three sizes intact), but it makes cutting to the smallest size a bit tricky, especially around curves. Also this pattern has long thin bits which are very prone to distorting when pinned to fabric (as all tissue does) To minimize distortion as much as possible I left the prong things joined together and used a BRILLIANT tip I found in Threads magazine (Issue 148, p22). I traced the cutting line with a sharpie marker - the ink bleeds through the tissue and leaves a mark on the fabric. 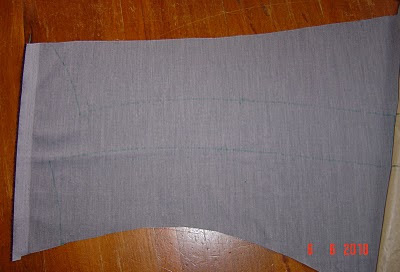 Since it's the cutting line it's not going to show on the garment (it will usually be cut off by the overlocker anyway), and it doesn't damage the tissue - genius! This is what the marked cutting line looks like when you take the tissue away - perfectly visible. I drew the notches onto the outside of the cutting line so I could mark them with snips into the seam allowance as I usually do when I cut. The one above was done with a teal sharpie, the one below with a fine line black one. Isn't that great? 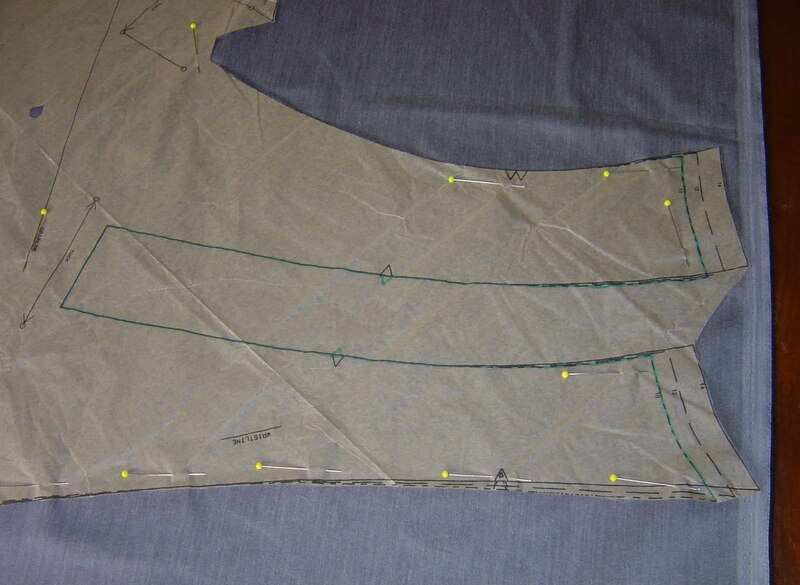 I used to do the same thing with dressmakers carbon and a tracing wheel, but of course the wheel damages the already flimsy tissue which is far from ideal. This way the pattern is undamaged, the marks are very accurate and best of all it's super quick and easy peasy. I might try a variation - tracing from pattern to paper. Thanks for the tip.. fingers crossed about your TM item. I do love vintage fabric so from time to time I wander on over to have a browse but the sellers invariably annoy me with their mis-information. (Calling something a liberty print when its not, saying the fabric feels nice and soft and is probably a cotton (no burn test to verify and in fact its acrylic) etc etc. So I hope your purchases bring you much joy. Not such a dull post to me -- I find this tip very helpful! Thanks for posting.